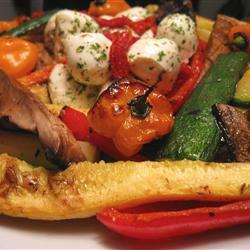 Place Aubergine, red bell peppers, courgettes and fresh mushrooms in a medium bowl. In a medium bowl, whisk together olive oil, lemon juice, basil and garlic. Pour the mixture over the vegetables, cover and marinate in the refrigerator at least 1 hour. Place vegetables directly on the grill or on skewers. Cook on the prepared grill 2 to 3 minutes per side, brushing frequently with the marinade, or to desired doneness.